Tacking is a complicated process involving the whole crew. The difference between a good one and a bad one is hundreds of feet loss to weather, not including possible personnel or gear damage. 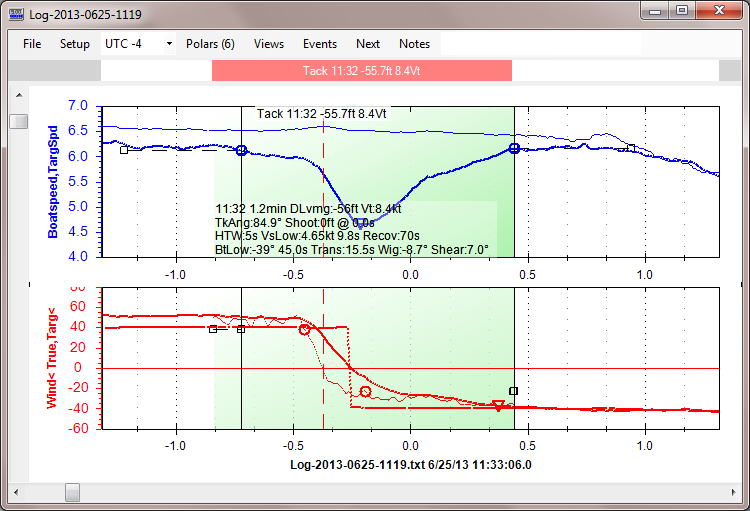 Tacking is an important part of racing, so tack analysis will improve performance and produce more consistent results. Turn into the wind. This produces a bit of a gain before the boat slows down. Bear off on the new tack. The boat slows down AND turns away from the wind, both lowering your Vmg. Begin to accelerate to target speed. The tack ends when you return to your pre-tack Vmg. Tack loss is the distance traveled to weather during this maneuver which is less than the distance you would have traveled to weather if you had not tacked. Distance is speed over time, so plotting Vmg (speed made good to weather) and then figuring the area between the curves (tacking vs. not tacking) produces the answer. A good tack is usually about 2 boat lengths loss to weather, and takes from 30 seconds to 3 minutes depending on size and weight. Improving your tacking takes practice. And for practice, you need to have a score so you know when you did good and why.